The book “Blood and Iron Origin of the German Empire As Revealed by the Character of Its Founder, Bismarck,” by John Hubert Greusel is not so much a biography of Bismarck as it is a pean to an idea, an homage to a theory of History. Historiography has its fashions just like other disciplines. In the late 19th century the “History is Made by Great Men” theory gained prominence among a certain set. Existence, political or otherwise, is about struggle for survival and little else. Civilizations have moral codes to help check our naturally competitive instincts, and these serve a good purpose — most of the time. But times arise that call for a transcending of such codes. We don’t like to admit it to ourselves, but the vast majority of us lack the strength of will and purpose needed to accomplish what needs done. Society craves champions. “Great Men” arise to meet such a challenge. Such men have vast intellects and plentiful energy. They can mold the minds of men and make Lady Fortune their mistress. Their grand vision naturally requires sacrifice, but they sacrifice themselves most of all to their ideals. They sacrifice the prevailing mores of the time to this ideal as well. Their “greatness of soul” excuse all their crimes and vices, some of which are only mere convention anyway. Such “Great Men” are beloved by some, hated and reviled by most others. Inevitably, “lesser” men gang up on them and bring them down, but the “Great Men” manage to have the last laugh. They gain immortality by their deeds and the impact they leave behind. Bismarck most definitely could be written about this way, and that is how Greusel treats him. Fashions change of course, and historiography changed. By the mid-20th century historians had stopped focusing on the great men and swung the pendulum to examine culture, environment, and the everyday (think Fernand Braudel). Interestingly, the “Great Man” approach coincided with the advent of Nietzche’s philosophy of the “over-man” and the heyday of imperialism. Historians’ focus switched as empires collapsed and the civil rights movement began. First, a word about Greusel specifically. His writing has an endearing quality, because he cannot contain himself. He gets carried away with his subject, with both Bismarck and the Idea. Each page has multiple exclamation points to accompany the exalted language. A typical paragraph might look like . . .
And here is Bismarck, striding over the plain of Sedan. Look at his steps, like a Colossus! His face — o his face! — triumphant in his glory. But look close. Is that a tear in his eye? A tear for the slain, the cost of victory? Weep, o weep Bismarck, if you must, but not here, not now. Watch him suppress his anguish, for what is the cost? This is Germany’s hour! Watch Bismarck complete the triumph. For he will drink champagne — yes champagne! — right in Versailles where Louis XIV looked with eagle eye over his foppish band. Bismarck guzzles the liquid, as he guzzles glory! For here we have a man who loves and hates like no other! Entertaining in doses, but not entirely informative. Greusel does not entirely gloss over Bismarck’s faults, but he keeps returning to the idea that, “You need Bismarck on that wall, you want Bismarck on that wall!” Germany needed united, after all, and it took a force of nature to overrule a pathetic Parliament and outmoded provincial princes. Thus Bismarck fulfilled, “the secret yearning of the Teutonic Heart,” (his words, not mine) and the immensity of the task meant that immense deeds needed done, and lesser men must give way to The Deed. I’ll give Greusel credit for this: he does not hide his thoughts in flowery prose. He has no qualms with making his views obvious, such as his intolerance for weakness or the “pettiness” of democracies. His heroes are the Great Men, who serve the god Will, embodied in the German national consciousness. I have profound antipathy for the “Great Men” theory of History for many reasons, but we must first understand its appeal. We admire strength because we do need it at times. Part of us can’t help but agree with Colonel Jessup. Certain times call for clarity of vision and courage to make difficult decisions when all others see a foggy grey landscape. The question is, what kind of strength do we need? The theory absolves one of responsibility. Bismarck’s individuality gets merged into something resembling Fate. For all of Greusel’s croonings about how Bismarck was a “man” his treatment of him abstracts Bismarck to the point where he no longer is an individual, but a Type. As a colleague of mine rightly pointed out, a great gulf exists between the Great Men and Biographical approach to History. The biographical approach values their subjects as men/women, rather than seeing them through the lens of imagined archetypes. This absolving of responsibility allows the characters of this treatment (Napoleon, Alexander, etc.) to indulge via proxy in childish shifting of blame. “It’s not my fault! He did it!” Again, not particularly manly. Great Men adherents tend to think that force is always the correct solution. Napoleon may have been right that Europe needed unity, and that every war between European nations had the character of a civil war. But his conquests provoked far more war than existed previously. 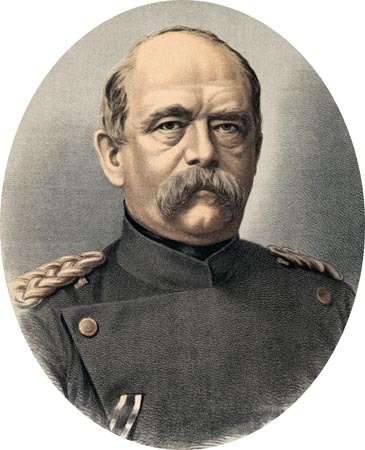 Bismarck wanted to Germany to unite, and I suppose that Germany had a right to unity if they mutually desired it. But Bismarck did not want unity through a democratic process. He wanted to create Germany through the forge of blood and iron. Only in that way could he serve his god. The theory predicates itself on the unremitting “struggle of life.” But if History means looking at actual people in time, we should ask if “struggle” defines human existence. Obviously struggle is part of life, but it also seems like most of the time people watch tv, hang out with friends, read books, visit relatives, etc. Not so much on the theory but on Greusel specifically — why exactly did Germany need united, and why did it need to get that unification at the expense of a patient democratic process? Greusel never addresses this question directly. It is easy to make plans of quasi-political salvation of the world. . . . And when such plans go wrong, it is easy to find a culprit–easy for the idealist to bring out from under his sleeve that doctrine of human sinfulness which would have been much better to face squarely and fairly in the first instance. At a later stage in the argument the disillusioned idealist trounces the people who opposed him, brings human wickedness into the question as a deux ex machina. . . . And now he discovers human wickedness with a vengeance, for on this system the sinners are fewer in number, and thus must be diabolically wicked to make up for it. Nothing more completely locks humanity in some of its bewildering predicaments and dilemmas than to range history as a fight between the righteous and the wicked, rather than seeing initially that human nature–including oneself–is imperfect generally. For who does not see, when he thinks of it, what assumption it is that they could not be vanquished under vanquished defenders, and that they only perished because they had lost their guardian gods, when, indeed, the only cause of their perishing was they chose for themselves protectors condemned to perish. Finally Greusel’s abstraction of Bismarck has him overlook aspects of the man that don’t fit his theory. I’m no great fan of Bismarck, but after 1871 he showed a measure of restraint in foreign policy. He thought imperialistic ventures foolish and self-defeating, for example. Germany only embarked on extensive colonialism as he lost power in the government. Was this a “conversion experience” that Greusel overlooked, or is Bismarck just more complicated that he lets on? I suspect the latter. Therefore the book, while entertaining in parts, may reveal more about Greusel than Bismarck himself.